Some say that when the average “mom-and-pop” retail investors get back into the stock market, it could be time to get out. But what about when even teenagers start buying? 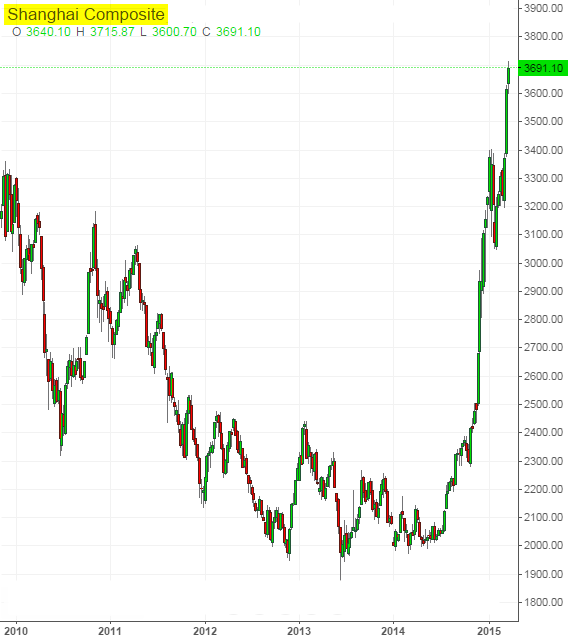 China has entered a new stock frenzy, like something out of America in the Roaring 20s or the dottiest days of the dot-com bubble, with trading volumes continuing to push to new record highs. On Wednesday, combined trading on the Shanghai and Shenzhen markets hit 1.24 trillion yuan ($198 billion), the seventh straight session in which turnover surpassed the 1 trillion yuan mark. By comparison, the New York Stock Exchange typically saw $40 billion-$50 billion a day in trading during the first two months of this year. The Shanghai Composite Index is hovering near its seven-year closing high of 3,691, hit on Tuesday when the index completed a 10-session winning streak. For the year so far, the benchmark is up 13.8%, making it the best-performing major East Asian stock index of 2015 to date, though it still has a way to go to match 2014’s 53% surge. The lure of flush times on the Shanghai market is sweeping in unlikely investors by the hundreds of thousands. This week, both the China Securities Daily and the Beijing Morning Post had dueling reports about recent college graduates and, yes, teenagers buying shares. Typically these young investors speculate with money given to them by their parents, according to a Great Wall Securities broker quoted in the Beijing Morning Post story. 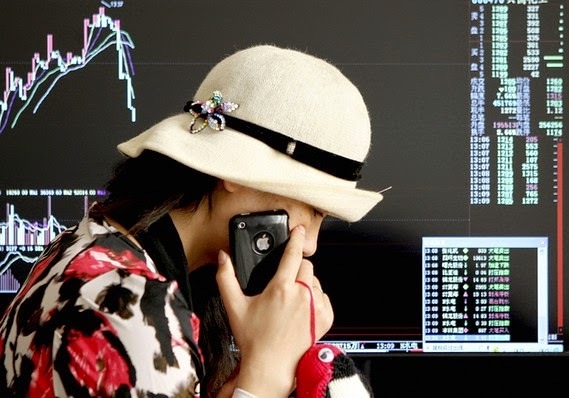 Yet another report, this time by the Beijing News newspaper, relates that at the Beijing trading halls of China Securities Co., “even the cleaning lady” has opened an account to play the market. The data appear to agree with the anecdotes: Within the last week alone, 1.14 million stock accounts were opened in China, the biggest such surge since June 2007, according to China Securities Depository & Clearing Corp.
After holding an overweight rating on Chinese shares since August of last year, Merrill Lynch is now cutting the market to neutral, making it clear that economic problems — especially looming deflation — suggest the current environment doesn’t justify buying into stocks. “China’s real interest rates remain too high, the currency is too expensive, fiscal policy is tight, and debt deflation is taking hold,” the analysts said. “We are now concerned that the scale of monetary/fiscal easing required in China is so large, and so radically different from where policy makers’ assessments are, that an overweight [rating] is no longer tenable,” they said. Speaking at a panel with financial journalists Wednesday in Hong Kong, Sanft said the climb in Chinese stocks is partly due to the fact that the Shanghai market has been moving off of an extremely low base over the past 10 to 20 years. According to FactSet data, the Shanghai Composite’s milestones tell a story of Octobers: The benchmark turned 1,000 in October 1996, then peaked at just above 6,000 in October 2007, before crashing to a post-crisis low of 1,665 in October 2008. On Thursday, the index closed at 3,682. Macquarie China economist Larry Hu, speaking at the same event, said Chinese stocks still have room to grow, if only because the country is in the process of reforming and developing its equity markets as a channel for companies to raise funds directly. Currently, Chinese companies mainly source funds through indirect means, such as commercial-bank loans. Hu also said Chinese shares are benefiting from trouble in other asset classes. Trust products have turned risky amid the weakening economy, and the real-estate market is in decline, so stocks now look more attractive to Chinese households, he said. What does this remind me of? Ironically, it reminds me of the Greek stock market bubble of 1999. Back then, I remember visiting Greece in the summer and everyone was so consumed by the spectacular gains in the stock market. It was mass hysteria unlike anything you could imagine, to the point where I would walk in a store to buy clothes and the owners and employees were more preoccupied with what was going in the Athens Stock Exchange than servicing me. China's house prices are sinking at the fastest pace on record, but you wouldn't know it by looking at the country's massive property companies. Prices tumbled 5.7% in the year to February, falling across 66 of China's 70 biggest cities. China's booming economy has driven a colossal supply of houses, including the ghost cities for which the country is now infamous. But the country's growth is slowing considerably, falling to the lowest level in 24 years in 2014, and falling house prices raise the risk of a debt overhang — when households and businesses have more property debt than the buildings they own are worth. Rabobank's analysts suggest the crash "likely still has years to play out given the level of oversupply." And you would think that would be bad for China's big property and real-estate companies. After all, residential and commercial buildings are what they sell to make their living, so falling prices certainly seem like a bad thing. But shares of China Vanke, the country's largest property developer, rose by 4.04% on Wednesday. It's a similar story for Poly Real Estate Group, another massive developer. Shares rose 5.05% overnight and are up by more than half in the past year. In fact, both companies easily outstripped the 2.13% rise in Shanghai stocks overall on Wednesday. But why? The answer lies in the perverse incentives on offer — and the fact China's Evergrande Real Estate Group just got a $16 billion (£10.85 billion) lifeline from China's state-run banks. The Chinese leadership is concerned about the health of the country's property market because it is so deeply interconnected with other parts of the economy. Real estate is an important driver of steel consumption, loan growth and jobs for sales agents and migrant construction workers. A drop in home prices hurts ordinary Chinese because they tend to invest a disproportionate amount of their savings in real estate. It's a more extreme version of the "good news is bad news" phenomenon that a lot of investors closer to home have complained about in recent years — that positive economic news is bad news for stocks because it's a sign that government or central-bank support could be pulled away more quickly. Property prices falling in China means more bailout money. In fact, Kaisa Group, another property developer that defaulted on offshore bonds in January saw share prices surge Wednesday, up 9.52%. China's house price crash may well be bad news for China, but perversely, it's good news if you're a struggling property developer. How concerned are China's leaders? Enough to cut rates earlier this month and to just announce they are loosening home-buying rules to counter the economic slump. How concerned am I of what is going on in China? A lot more concerned than the big fat Greek squeeze being played out right now in that country's lose-lose game Soros and others are betting on. Unlike the Greek stock market bubble, which was a fart in the winds of history, the property and equity bubble in China spell huge trouble for a world grappling with deflation. Importantly, a boom-bust scenario in China will pretty much ensure global deflation, which is why I maintain if the Fed goes ahead and raises rates, it will be making a monumental mistake. Below, a discussion from The Economist's Buttonwood Gathering 2015 featuring Ashvin Chhabra, CIO of Merrill Lynch Wealth Management, Rebecca Patterson, CIO of Bessemer Trust and Kyle Bass, CIO of Hayman Capital Management (h/t, Zero Edge). Take the time to listen to this discussion, it's very interesting. Ms. Patterson was the person that impressed me the most but Chhabra and Bass raise excellent points too. Interestingly, they waited till the last minute to discuss the China bubble, which is ridiculous given how important it is for the global economy. And for all you biotech skeptics that razzed me on Seeking Alpha, including Mr. Bass whose fund is actively shorting biotech shares (he doesn't get it, just like his short JGB call), take the time to watch Sunday evening's 60 Minutes clip on killing cancer which discusses incredible advances in immunotherapy to treat a deadly brain cancer and possibly many other cancers (watch Part 1 and 2 here). As I predicted back in 2008, the Age of Biotech has arrived and we will all benefit from amazing advances in the health sector. But once again, I'm not saying that a biotech bubble isn't possible or won't happen (it most certainly will) or that there isn't lot of hype in some smaller biotech companies, or that this biotech secular bull won't be very volatile (it is and will remain very volatile), but I think investors ignoring biotechs altogether based on some irrational bubble fears just don't understand the sector or why traditional valuation methods are poor indicators of the strength of many smaller biotech companies (for example, fast cash burn rates are normal for smaller biotechs funding research trials). This is why I recommend you focus on the biotech ETFs (IBB and XBI) or just buy shares of the big biotech giants like Biogen (BIIB), Celgene (CELG), Gilead (GILD) and others which make up the top ten holdings of the iShares Nasdaq Biotechnology (IBB). If you are looking to invest in smaller biotech shares, pay attention to what top biotech funds like the Baker Brothers, Broadfin, Deerfield, Healthcor, Orbimed, Perceptive Advisors, Fidelity and others I regularly track are buying. They all know a lot more about biotech than Kyle Bass and Hayman Capital. Finally, know your personal risk tolerance. If you can't stomach huge swings in biotech shares, avoid investing in this sector altogether and stick to some relatively safe dividend ETFs like SDY or VIG but be aware that high dividend stocks will get whacked hard as the lift-off tantrum unfolds in the United States. Of course, once the China bubble bursts wreaking havoc on the global economy and ushering in an era of global deflation, it will have a profound effect on all risk assets, so enjoy the liquidity party while it lasts because when the titanic sinks, it will destroy institutional and retail investors which are ill-prepared for the storm ahead (don't worry, despite the constant dire warnings of Zero Edge, Armageddon isn't at our doorstep yet). A Buyback or Biotech Bubble? The Great 401(k) Experiment Has Failed? The Big Fat Greek Squeeze? Will Japan's Pensions Save Abenomics? How Scary Is the Bond Market? Unwinding the Mother of All Carry Trades? America's Attack on Public Pensions? Focusing Capital on the Long Term?